Welcome to a short tutorial on how to draw the detective himself. The first two figure sets were drawn by Elaine and are used with her permission. The second figure set are poses she followed by watching The Great Mouse Detective film itself. The third figure set is a very large collection of sketches created by Lina Simonen and is used with her permission. 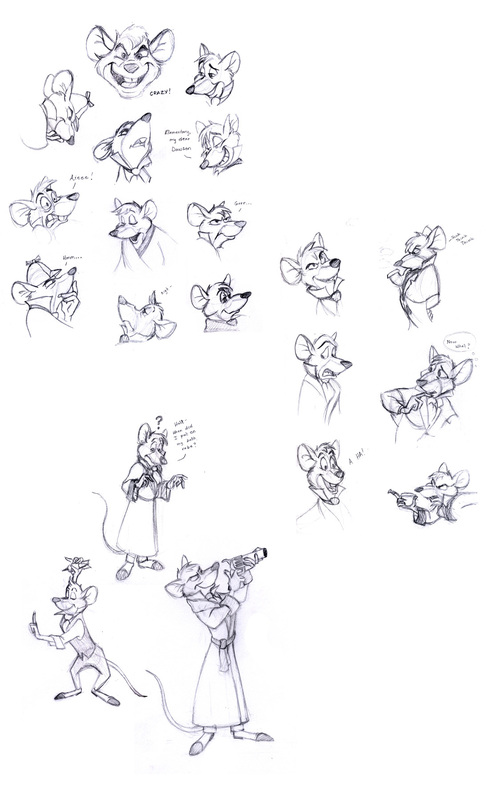 It is a very helpful guide showing how Basil looks in almost every scene. 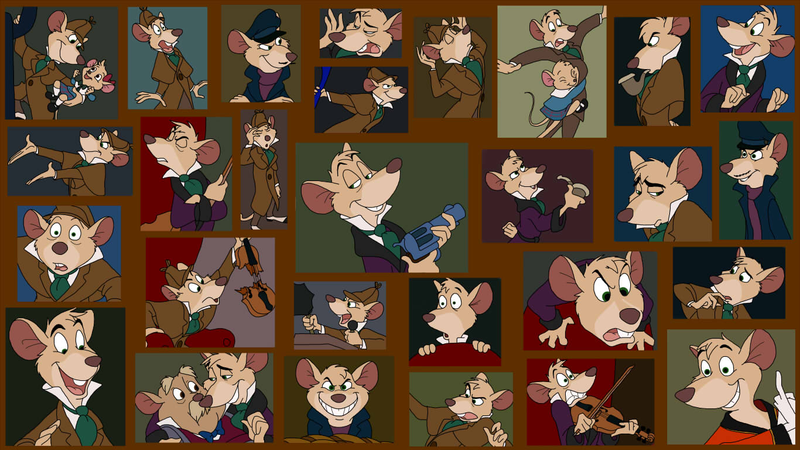 The fourth figure set is titled The Many Faces of Basil of Baker Street and it was created by Aralyn. Finally, the fifth figure set is 80 x 80 sized icons of Basil in full color of his many different facial expressions, or moods if you will. There are 132 in total. Each mood is available for the Mood Theme of Live Journal. The Basil Moods were all created by me (Brina), so please do not take any of them without written permission. Thank you! Detective attire: The deerstalker hat is shaped like a rounded triangle with a bill on either side. The bill in the front is smaller and sticks out like the bill of a baseball cap while the back side lays flat against his head. A small knot with two loops sits on the top in the center. The Inverness coat, usually sleeveless, is all connected as one elaborate piece of material. The collar forms like a standard coat with an extra sleeve (or "wing") covering the shoulder down to the crook of the arm. The coat length drapes to a little below the knee with it slightly open up to a single dark brown button located on the right side (his left). Around his neck is a sea green cravat, or tie, possibly made of silk. The base is broad and covers most of the view of the white dress shirt. The dress shirt collar is an unfolded high neck with the string of the cravat securely around it. The trousers, colored dark gray, are thin cut and stop at the ankle. The shoes are dark brown with off-white or light grey spats on top. Smoking jacket or housecoat attire: A simple robe colored a purplish burgundy with the cuffs, collar and waist tie colored dark greenish blue. The length is just below the knee and it is usually worn over his dress shirt, cravat, and waist coat. Face: The standard shape of the eyes are oval with black pupils. Frowning changes shape to half the size of the oval and often to a half circle. The brows are black, thin and long, usually lined with the size of the eyes. The bridge of the nose has one bump on the top. Think of a hawk's nose when drawing it. The nose itself is oval-shaped and points outward. The crack of the lip from his mouth usually lines with the lighter shade of his fur. The teeth are standard vertical lines with the two main upper incisors visible depending on how big the mouth is open. Head: The shape of the head appears oval with more roundness in the cheeks. The strands of fur on his head change in many ways depending on when he rustles a hand through them. The standard strands are usually three, two big, one small. The ears are a large half circle and have a fold to them on top. Two lines are shown coming from the inside of the ear. What are those lines, you ask? I consider them a set of small veins, and two is enough for just that purpose. Hands: The hands are very thin with long, delicate fingers. There are no cuticles on them. For the standard toon character, he has three fingers and a thumb. Feet: Due to his height, it is no surprise for Basil to have long and thin feet. The shoes are covered with spats and often have a fold in material by the toe line. Tail: When drawing the tail, the base begins thicker and then gradually thins by the tip. It is not very long and curls.